There's plenty of parking around the downtown festival grounds - so you can leave the parking stunts, pictured, to the East Texas Jeep Club! Event Map - click here! Festival Guests - Parking is available and free of charge on the perimeter of the festival. Please be respectful of private property, barricades and do not park in marked No Parking zones. Additional parking for people with disabilities is marked in the Commercial Bank of Texas parking lot on the north side of the festival, entrance on N. Fredonia St. Vendors - will receive special set-up and parking instructions at the festival. 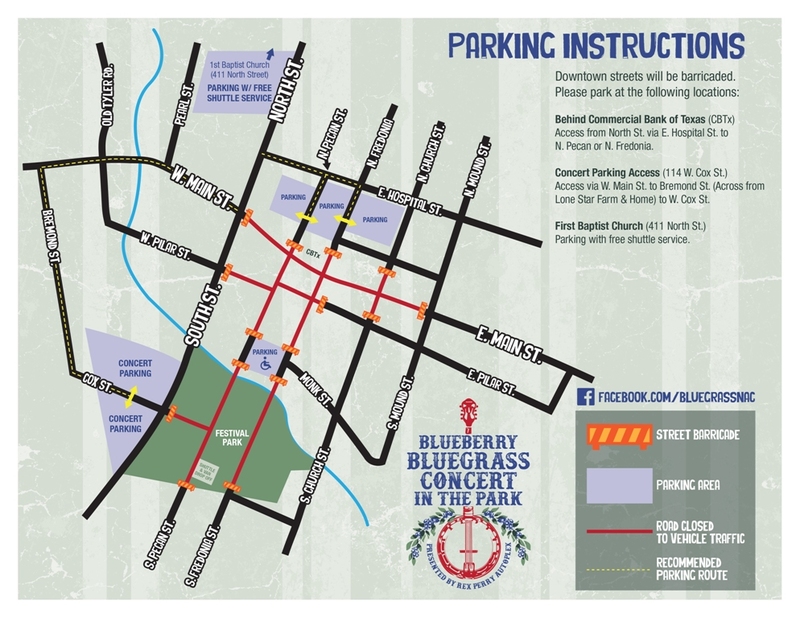 Entertainment - will receive instructions for parking, unloading and loading, prior to the festival. Thank you, all, for making your way to the 30th Annual Texas Blueberry Festival presented by Tipton Ford-Lincoln! The Blueberry Bluegrass Concert in the Park, presented by Rex Perry Autoplex, will be held this Friday, June 7 from 6:00 until 10:00 PM. The concert is free and open to the public. Several food vendors will be on site, and restrooms will be available. Volunteers with golf carts will assist those with mobility challenges getting from the parking lot to the concert seating area. This is a family-friendly event, and no alcohol or coolers are allowed. Concert-goers should bring blankets or lawn chairs for seating. This year, children’s activities will be directed by the Nacogdoches Public Library staff during the concert. Performing at this year’s concert are the Blake Brothers Bluegrass Band, The Baker Family, The Purple Hulls, and Sabine River Bend Band.